Joe Margoneri’s golden left arm was his ticket into professional baseball. Blessed with a blazing fastball, Margoneri caught the attention of the New York Giants scouts after pitching on the sandlots of Smithton, Pennsylvania. Margoneri signed without a bonus and for the 1950 season made his professional debut in Oshkosh, Wisconsin. His speed overpowered the hitters in the league, as he finished the season with a 23-4 record, and advanced two levels to Class B Sunbury the next season. “I did decent there; I had 18 wins,” he said. Just as he was poised to continue his ascent in the Giants organization, Uncle Sam called. He spent the next two seasons (1952-53) stationed at Brooke Medical Center in San Antonio, Texas. His teammates included some big names that were familiar to New Yorkers. His time in the service provided him with an opportunity to stay sharp for his return to the Giants. During that 1954 offseason, Margoneri traveled south to play for Magallanes in the Venezuelan Winter League. He led the team to a second place finish in the Caribbean Series, which included squaring off against his future teammate Willie Mays, who was playing for the powerhouse Santurce club of Puerto Rico. He handed Santurce their only defeat of the series, surrendering two runs in a complete game victory. His performance didn’t go unnoticed. He showed up to spring training in 1955 and immediately caught the attention of Giants manager Leo Durocher. In the March 7, 1955 issue of the Long Island Star-Journal, Durocher raved about Margoneri’s prospects. The Giants felt he was ready for their highest minor league competition and sent him to their AAA team in Minneapolis. 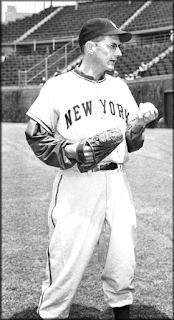 Margoneri helped lead the team to the 1955 Junior World Series Championship, defeating the Rochester Red Wings of the International League in the best of a seven game series. The long season, including his time in the winter leagues, was almost a two-year stretch of non-stop pitching. Just as he was inching close to the major leagues, he started to have problems with his pitching arm. “That’s when my arm trouble started. I was throwing 150 pitches per game and became a bit wild,” he said. Margoneri rested his arm in the offseason, and in 1956, he was rewarded for his perseverance. On April 25, 1956, he made his major league debut against the Brooklyn Dodgers at the Polo Grounds, pitching one scoreless inning in relief. Margoneri did more than hang on, he excelled. By mid-August, he was 5-2 with a 2.77 ERA. Things were looking up for the left-hander, and then his sore arm resurfaced. He won only one of his next five decisions, finishing 6-6 with a 4.04 ERA. Looking back at his rookie season, Margoneri savored the opportunity to brush shoulders with a future Hall of Famer. “I had my locker next to Willie Mays. He was phenomenal. He did everything,” he said. He even had a Mays moment of his own against the Chicago Cubs in New York, when he hit his lone major league home run. He pitched 13 more games for the Giants in 1957, and was sent down to the minors for good halfway through the season. He continued to pitch until 1960 before moving on from baseball, where he worked in a paper mill for 30 years, retiring in 1991. “I started practically on the bottom in 1962 went until 1991 and moved up the ladder. I was a supervisor the last 15 years making corrugated boxes,” he said. Still popular with the fans, he often receives mail requests to sign his 1957 Topps card. He gladly returns them. Topps honored him in their 2006 Topps Heritage set, traveling to his home in West Newton, Pennsylvania, for him to sign replica cards as special inserts in their packs. At 83, his focus now is his family, which includes a budding pitching star. “I raised five daughters, 13 grand children and my fifth great-grandchild is on the way. I’ve been married 58 years to my wife Helen. She went to one local high school and I went to another and she was my childhood sweetheart,” he said. His granddaughter Nicole Sleith is an ace left-handed pitcher for Robert Morris University's softball team. So does he offer words of wisdom about facing the likes of Duke Snider, Ernie Banks, and Stan Musial?